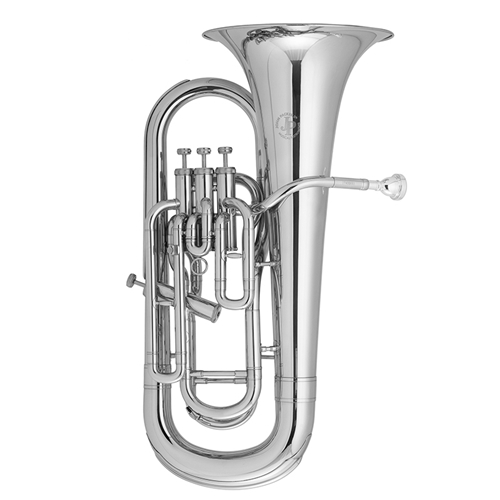 DescriptionSpecifications The JP174S is durable non-compensating Bb student euphonium popular with many within the UK education sector. Ideal for progressing players and those looking for a lightweight instrument for young players, the JP174S includes a 4th valve giving access to the lower notes without the extra weight of a fully compensating system. The inclusion of a rose brass leadpipe enables players of all standard to achieve a full, rich sound whilst it's 11" bell gives good projection. The JP174S Bb Euphonium is constructed from yellow brass throughout with the inclusion of a rose brass leadpipe. The instruments features a .661" bore, 11" bell and bottom sprung valves for a smooth and free action. A bell ring is also included as standard, as with all JP Musical Instruments providing a robust and rigid construction perfect for schools, music services and training bands. The JP174S is supplied with a JP mouthpiece and a high quality lightweight case featuring wheels, YKK zips throughout and useful side storage pocket. The case is well built and sturdy ensuring maximum protection for the instrument in all settings, whether in a school storage cupboard or being transported to and from lessons. Popular with schools and music services, JP Musical Instruments understands the importance of a high quality case no matter whether the instrument within is of a student or professional level. Manufactured to a high quality standard as is expected with all JP Instruments, The JP174S Bb Euphonium is guaranteed for 12 months against faulty manufacturing or materials.